The Mexican flag is pretty cool. With fields of green, white and red, it features an eagle clutching a snake in its talons, which represents the founding of the Aztec capital Tenochtitlan, now Mexico City. These frjoles bandera (literally “flag beans”) capture the colors of the flag but are 100 percent snake-free. 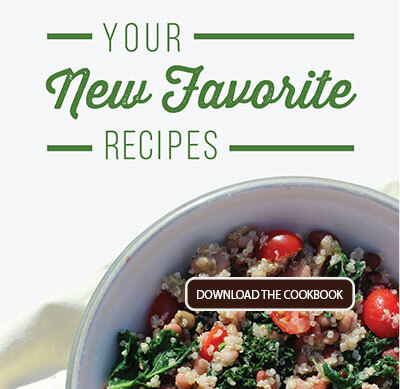 Your family will love the bold and zesty flavors, and the dish isn’t spicy, so it’s perfect for younger eaters. 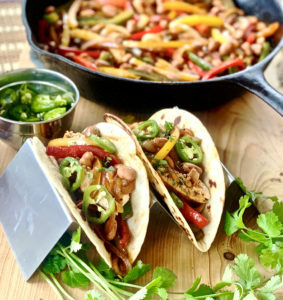 With sweet red tomatoes, spicy Serrano peppers and cool crema (or Mexican sour cream), these pinto beans are a delicious accompaniment to fajitas, tacos or any other Mexican recipe. 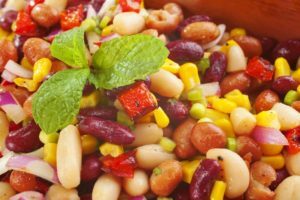 This vegetarian dish is also a tasty way to get your protein fix, as our Deluxe Pinto Beans are packed with clean, muscle building energy and take on bold flavors nicely. 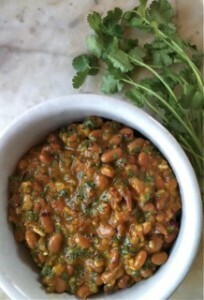 Heat the beans through and combine with other ingredients. 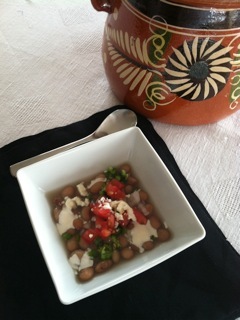 Garnish with crema and queso fresco. Serves 4.